Even though America’s fiscal problem is entirely the result of too much government spending, I wrote earlier this year that there were all sorts of scenarios where I would agree to a tax increase. But I then pointed out that all of those scenarios were total fantasies and that it would be more realistic to envision me playing center field for the New York Yankees. The fundamental problem is that politicians never follow through on promises to reduce spending – even if you use the dishonest Washington definition that a spending cut occurs whenever the budget doesn’t rise as fast as previously planned. And to make matters worse, they always seem to want class-warfare tax hikes that do heavy economic damage rather than the loophole closers that at least get rid of some of the inefficient corruption in the tax code. That’s why I like the anti-tax pledge of Americans for Tax Reform. You don’t solve America’s fiscal problems by saying no to all tax increases, but at least you don’t move in the wrong direction at a faster rate. Notwithstanding the principled and pragmatic arguments against putting tax increases on the table, some Republicans – in a triumph of hope over experience – are preemptively acquiescing to tax hikes. Here’s what Jeb Bush said. Jeb Bush, the former Florida governor, said Friday that he could back a broad deficit plan that increased taxes, a stance that puts him at odds with other prominent Republicans. Bush told a House panel he could get behind a plan that combined 10 dollars in spending cuts for every dollar of new revenue… “The problem is the 10 never materializes,” [Congressman Paul] Ryan said after Bush said he could support a revenue-increasing deficit deal. Norquist also has criticized deficit deals crafted in 1982 and 1990 – the latter agreed to by then-President George H.W. Bush, Jeb’s father – for failing to deliver on the spending side. Kudos to Paul Ryan for making the obvious point about make-believe spending cuts. And Grover is correct about the failure of previous budget deals. Indeed, I cited a New York Times column that inadvertently revealed that the only budget deal that worked was the 1997 pact that cut taxes rather than raised them. Jeb Bush isn’t the only apostate. Here’s what Senator Graham had to say. Sen. Lindsey Graham (R-S.C.) said Tuesday he believed Republicans should consider eliminating loopholes in the tax code even if they aren’t replaced by additional tax cuts, a move that would break with an anti-tax pledge many GOP lawmakers have signed with activist Grover Norquist. “When you eliminate a deduction, it’s OK with me to use some of that money to get us out of debt. That’s where I disagree with the pledge,” Graham told ABC News. …”I’m willing to move my party, or try to, on the tax issue. I need someone on the Democratic side being willing to move their party on structural changes to entitlements.” Graham said, for instance, he would support a plan that included $4 in spending cuts for every $1 in tax increases. During a Republican debate last August, all eight Republican candidates in attendance said they would reject a proposal to trade $10 in spending cuts for even $1 in tax increases. In some sense, Senator Graham’s comments are reasonable. With real spending cuts and less-damaging forms of tax hikes, an acceptable deal is possible. But only in Fantasia, not in Washington. In the real world, all that Senator Graham has done is to move the debate slightly to the left. I’ve noted that tax increases are political poison for the Republican Party, but I don’t lose sleep worrying about the GOP. But I do have nightmares about government getting even bigger, and that’s why I don’t want tax increases on the table. I don’t even want them in the room. Or the house. Or the neighborhood. 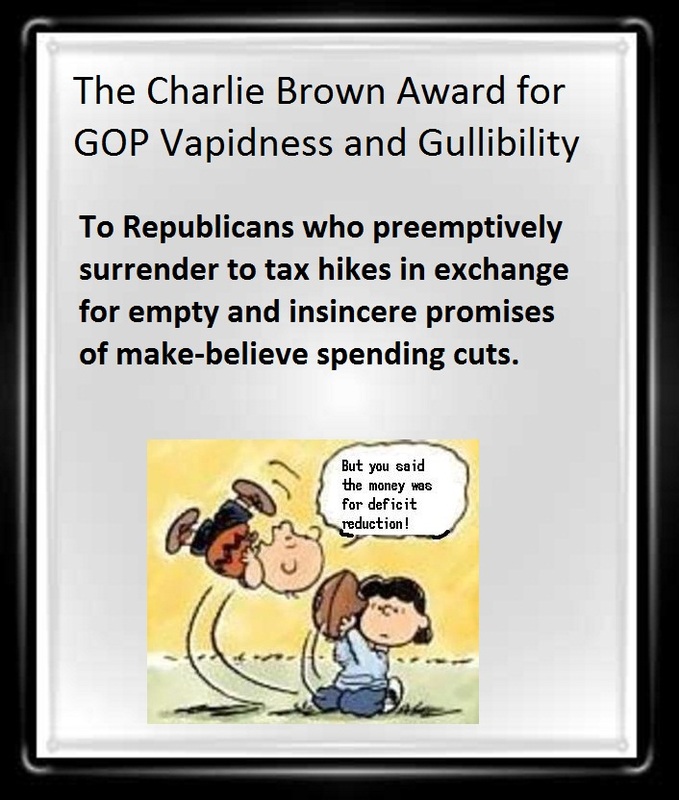 That’s why Jeb Bush and Lindsey Graham are the newest winners of the Charlie Brown Award. They’ve put blood in the water. I wonder if they’ll act surprised when hungry sharks show up looking for a meal? If you want to do a deal, you need to set it up such that the spending is reduced and stays reduced for 10 years. Then, if needed, the tax increases are put in based on the actual real spending cuts that ocurred during those ten years. Of course the spending cuts still will never happen. And if they did, the economy whould probably have grown enough that the tax increases would not be needed. The best steam cleaner can make easy, quick work out of the number of hotel cleaning tasks. The Haan HS-20 handheld steam cleaner is packaged having a range of useful nozzles and accessories. content, which reduces water consumption. Hard surfaces with tight corners, barely accessible overhanging edges, etc. I hope the speaker of the house will stand up to Obama and not give in to tax increases!! Somebody essentially lend a hand to make severely posts I’d state. This is the very first time I frequented your web page and thus far? I surprised with the research you made to create this particular publish incredible. Great job! Jeb Bush is just another establishment Republican like the other Bushes who never saw a spending bill they didn’t like. His brother didn’t veto a spending bill in the first six years of his term. Why do you think we have the spending mess? When Jeb said “…we need to get over Reagan…” I dumped him. You are in a negotiation. Here is how you recognize that the other side is lying to you about what they will do. The first proposed deal was $1 of spending cuts for each $1 of increased taxes. Then it was $4 of cuts per $1 of taxes. Then, the taunt was $10 of cuts. When the other side is willing to cheerfully trade large amounts of something to get your agreement,, then you know they have no intention of following through. They are willing to promise those things because they know that it will never cost them anything, no matter what the amount offered. Why do many folks consider Jebbie conservative? JEB! was a mediocre governor of Florida who gave us another six years of Bill Nelson when the Bush family broadcast self-fulfiling prophesy that Katherine Harris, daughter of Florida’s powerful Ben Hill Griffin clan, couldn’t beat the utterly out-of-touch Nelson. Now, for some reason JEB! thinks the conservative-voting-but-total-ditzhead Connie Mack IV can beat Nelson this go-’round. Ain’t gonna happen! Quatro, I knew Cornelius McGillicuddy, III. Tres was a friend of mine. You’re no Sen. Connie Mack III. Sorry, Jebbie, you and your family missed the chance to help Florida rid ourselves of Nelson last time. I don’t think this is going get past the TEA party. They really mean they’ve been taxed enough already. Figure out how to get by with what you’ve got, just like everybody else. Reblogged this on Let Common Sense Prevail.